Boonmee (Thanapat Saisaymar) is dying. His kidneys are failing and he doesn’t have long left in this world. While contemplating his difficult situation, he is visited by the ghost of his wife, Huay (Natthakarn Aphaiwonk). She died many years before and has returned to bring him comfort in his final days. Boonmee is also visited by his son, who disappeared after Huay’s death. No one has heard from him since he disappeared and he is now barely recognisable, having become a red-eyed ghost monkey. Thus surrounded by his loved ones, Boonmee is finally able to look back at his life - and the many lives before that. I’m sorry to say that Uncle Boonmee left me baffled. I think that I understand the gist of what is going on and the film’s deeper, spiritual message but I’m really not sure. Here’s what I do know. After the sadness of Amour, I was wary of watching another end of life movie. However, Boonmee is actually quite uplifting. There is something reassuring in the concept of reincarnation and of lost loved ones returning and giving comfort. Other than that, this film completely lost me in places, bemused me in others and frustrated me several times over. When Huay appears, it genuinely surprised me - it was so strange. Then, before I had a chance to process that development, there came the whole creepy, red-eyed ghost monkey bit. Meanwhile, and I don’t want to spoil anything for you, but there is a scene between a princess and a catfish that I found really quite bizarre. And not in a good way. I am sure that my reaction to Uncle Boonmee is largely down to ignorance. If I watched the film again I would (maybe) understand more. However, I just don’t think I could sit through it all again, sorry. Uncle Boonmee won the Palme d'Or at the 2010 Cannes Film Festival, becoming the first Thai film to do so. 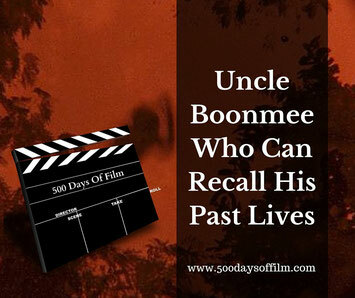 Have you seen Uncle Boonmee Who Can Recall His Past Lives? Did you get this film or enjoy it? Do please enlighten me by leaving a comment in the box below!